During the Second World War an ambulance was donated to the R.N.Z.A.F. by the Danish Association in New Zealand. A number of photographs in the collection of the Royal Danish Library document the event, but I have no other information. 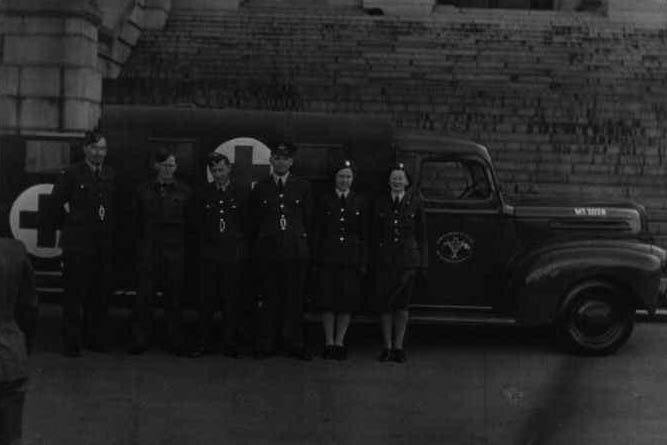 On 10 October 1943, at a small ceremony a delegation representing Danes abroad presented an ambulance donated to the Royal New Zealand Air Force by the Danish Association in New Zealand. According to the photographic evidence kept by the Royal Danish Library the Danish delegation consisted of where among others Mr. Johannes Andersen, Mr. Christoffer Langkilde and his wife, Mrs. Poula Langkilde Christie, Mr. A. Hislab, Mr. O. N. Haderup and his wife, and Mr. Eli Dahl. Participants on the part of the Government where Air Vice Marshall Leonard Isitt, Brigadier Fred Thompson Bowerbank, Director-General of Medical Services, and Defence Minister Frederick Jones. A small number of Danes in RNZAF service participated as well. According to the photo caption these where Mr. Peter Hansen, Mr. Kaj Mortensen, Mr. Knud Graae, Mr. Arne Møller, ambulance driver Mrs. Andersen, and Mrs. A. Haderup. I have at this point no information on where the ambulance actually went into service, but it is clear from one of the photos that it had the serial number MT.2028 and it had, of course, a shield on the presentation on the door.